Numerous examples of Ann's drawings can be seen on her website, which she set up in 2007, and her work is available to buy from her Facebook page (www.facebook.com/Annsd00dles) and from Etsy (www.etsy.com/uk/shop/Annsdoodles). Mandalas are usually circular patterns with their origins in Hinduism and Buddhism representing the universe, but recently have become a popular subject for coloring books. In their secular form they still provide artists and colorists with a zen-like calming but can be tricky to draw due to their many fold symmetry. 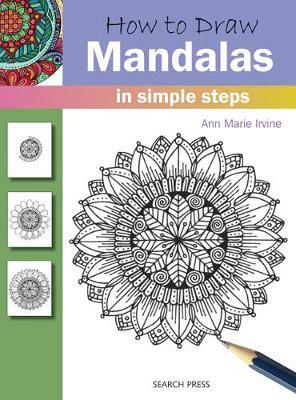 Here is a book taking the mystery out of drawing (and coloring) your own mandalas. There are eighteen mandalas to try your hand at in here, ranging from the simple one page to the more complex ones that take two pages. As with all the other titles in this series each mandala is broken down into six or more steps with each drawing showing a bit more added to it each time. In many of the books the new parts are drawn in a different color but here all lines are in black which is just fine for this type of work. These are not fine art pencil drawings but more diagram like and are all drawn in pen, with the final image colored in. There is one introductory page giving a brief description of a mandala plus hints on their execution; the rest of the book contains only the drawings which speak for themselves with no captions required. At the back is a gallery of all the projects colored in so you can select one and turn to the correct page. Most of the mandalas resemble abstract patterns but all have names showing their inspiration. Subjects include a sun, compass, fish, shells, flowers and insects and their stylized representation is very appealing. This is a very user friendly book on a subject often seen but not often explained for those who want to draw it. A very welcome entry to the series.